If you want to travel from Frankfurt to Cologne (Köln) or vice versa, you have several options; fly, drive or take the train. Here is an overview of all your transportation options from Frankfurt to Cologne (124 miles) and their pros and cons. Los! 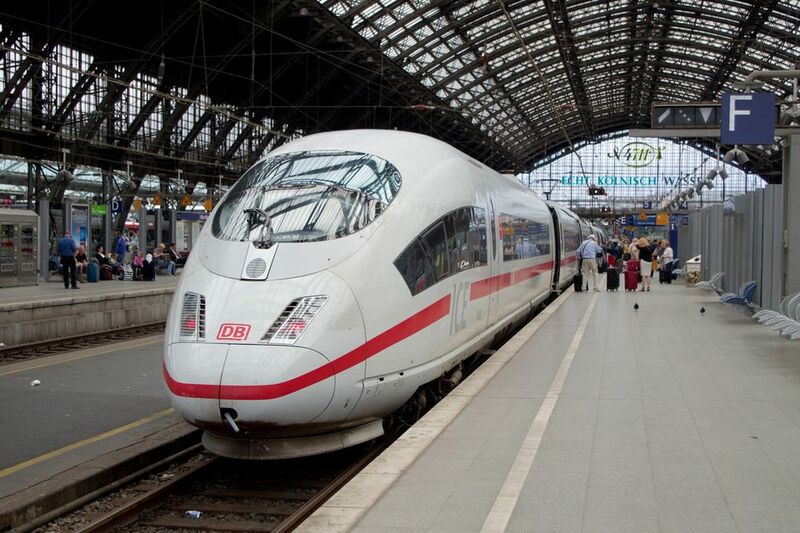 The fastest way to get from Frankfurt to Cologne is by train. The journey from Frankfurt (either from Frankfurt Central Station or Frankfurt International Airport) to Cologne will take you a little more than an hour, and there are plenty of trains going in both directions. Every hour, there are up to three ICE trains available, which reach speed up to 300 kilometers per hour. The Eurocity (EC) train has more stops but should be less expensive. Depending on whether you opt for a direct train or a route where you have to change trains, tickets are between $60 and $80 (one way). Get tickets and reserve a seat (optional) on the website of the German Railway (in English), or buy your ticket at a ticket vending machine at the train station. The earlier you can buy tickets, the better deals you can find. Besides being efficient, modern, and reliable, the train has another advantage: It will bring you right into the heart of Cologne, and the first thing you’ll see when you step out of Cologne’s Central Station is the grand Cologne Cathedral, one of Germany’s most famous landmarks. Going by car from Frankfurt to Cologne (or vice versa) will take about 2 hours. The fastest route is the Autobahn A3, which goes directly from Frankfurt to Cologne. Note that signs to Cologne will say Köln—its German name. Renting a car can be the best option for families to comfortably travel together and save money. Or it can just be your excuse to drive on the world-famous Autobahn! Base rates vary wildly depending on the time of year, duration of rental, the age of the driver, destination, and location of rental. Shop around to find the best price. Note that charges usually do not include the 16% Value Added Tax (VAT), registration fee, or any airport fees (but do include the required third-party liability insurance). These additional fees may equal up to 25% of the daily rental. The legal driving age in Germany is 18, but usually, drivers have to be over 21 to rent a car. Depending on the company, they may pay a premium until the age of 25. Reserve your car in advance (14 days beforehand ideally) for the best deals. Sign up for major company's (such as Hertz, Sixt, etc) newsletter or follow on social media for deals. German cars usually come with a manual transmission (gear shift). If you prefer an automatic transmission, ask the rental company and most can accommodate you. This may—like so many things—result in an extra charge. The cheapest—if least comfortable—option is by bus. And it is not all bad; the journey will take you 2.5 hours to get from city to city and can cost as little as $10. Bus tickets are a real bargain! Plus, comfort levels are boosted by bus services like wifi, air-conditioning, toilets, electrical outlets, free newspaper, air-conditioning, and toilets. Coaches are generally clean and arrive on time—barring issues with traffic. Compared to other travel options, flying is definitely not the fastest and cheapest way to get from Frankfurt to Cologne. Unfortunately, there are no direct flights between Frankfurt and Cologne (and vice versa). AirBerlin is a common carrier with stops are usually in Munich or Berlin with tickets running about $350 (depending on the time of year) and the flight (including stopovers) takes about 3 hours. With only 124 miles between the two, they are just too close to each other.